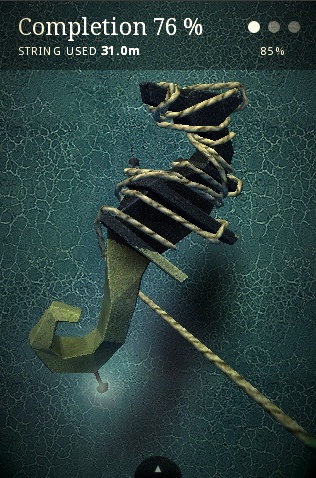 Secret Exit merges rope, wood and paint to create one of the iPhone's best. Zen Bound is the result of technical wizardry, a vibrant imagination and lots of love. Built from the ground up to take advantage of the iPhone's unique abilities, its designers managed to create one of the most gorgeous and innovative games to appear on the platform. Five bucks may seem a bit steep compared to all those .99 apps, but it's worth every penny. At its core, Zen Bound challenges you to wrap a piece of rope around a wooden object. Whenever the rope makes contact with the wood, it leaves behind smears of paint. The goal is paint the carving and move onto the next level; to complete a stage, wait until one of the nails glows and then tie it off with the rope. Since you don't have to cover something 100 percent to advance, this gives you the opportunity to see what the game has to offer in a short amount of time. Winding the rope around an object is both effortless and incredibly enjoyable. Sliding a single finger along the screen rotates the object, while two fingers spins it 360 degrees. You don't need to physically maneuver the iPhone to play, but if you want, you can combine that with the touch controls to make the game feel more realistic. In addition, you can unwind the rope to correct mistakes, though doing this removes paint. Numerous features make Zen Bound an immensely entertaining experience. Developer Secret Level did masterful work with the game's rope physics; it behaves as it does in real life. We also love the calm that we experience each time we play; without the threat of a time limit, we're free to just relax and figure things out. Combine that with the beautiful trees that blossom whenever we complete puzzles and the soothing music, and Zen Bound is without question one of the iPhone's most tranquil games. Much of the fun, however, comes from experimenting with each of the carvings and finding new ways to paint them. Something like a wooden block is easy enough, but the bird and lion pose unique challenges that had us scratching our heads. Eventually, covering things with rope gets a little dry and we need a much needed break, but we always come back. Zen Bound represents the best iPhone has to offer, a wildly addictive and peaceful video game that everyone should play. Download it immediately. What's Hot: Numerous puzzles to solve, exquisite controls, phenomenal 3-D models, superb presentation, casual yet extremely challenging. What's Not: Five dollar price may turn off budget conscious gamers.